The 2012 Section 179 Deduction limit after adjustment for inflation has increased to $139,000 (maximum allowance would have been only $25,000 prior to the new legislation). The 2012 Section 179 Deduction threshold for total amount of equipment that can be purchased has increased to $560,000 (threshold would have been only $200,000 prior to the new legislation). The Section 179 Deduction is available for most new and used capital equipment, and also includes certain software. The new law allows 50% “Bonus Depreciation” on qualified assets placed in service during 2012. However, this can be taken on new equipment only. Also, many businesses found Section 179 Qualified Financing to be an attractive option last year. How would you like to trim your tax liability? Alpacas, as well as other types of livestock, are the answer. Alpacas are by far, the easiest to manage ….. ask any large animal Vet who has worked with alpacas!! You can choose to enhance your real estate, purchase animals, and deduct expenses directly against earned income. If you prefer to agist or board the animals, you can capture the expenses and cost of the animals against passive income now and 15 years into the future. Tax deferred wealth building is another benefit. Taxes are postponed on the increased value until you are ready to start selling the offspring. Many alpaca breeders throughout the United States have recognized financial and personal gains. The rewards are many. Their initial investment has grown to a level that creates independence. Individuals have recognized that their current careers can be incorporated into alpaca breeding with positive results. Take for example the physician who has done extensive research into the Accoyo line of alpacas. He has been winning in the show rings and his progeny line is sought after before they are even born! As an added bonus, many of these same individuals will share their stories of how they begun and grew into today’s levels. The alpaca industry is full of many individuals willing to help you get started! Even if you are a passive investor you will still be allowed the following tax benefits. The only question remains as to whether you can take the deductions on a current basis. Also refer to Section 179 from the IRS that allows a substantial deduction each tax year for expenses. The passive owner’s losses that are in excess of current income can be carried forward and taken against future income. Timing is the issue. Alpacas in which you have cost basis can be written off over 5, 7 or 10 years if there are being held as breeding stock. Straight line or accelerated schedules allow for a percentage of the asset to be written off. Example: An alpaca is purchased for $20,000, depreciated for 2.5 years or 50% of its value and then resold for $20,000. There would be a gain for tax purposes of $10,000. Result = The adjusted cost basis is deducted from your sale price to determine gain or loss. Capital Gain Treatment: The sale of breeding stock qualifies for capital gains treatment. Please note that alpaca offspring do not qualify for capital gain but rather income taxes. Your accountant can advise you of your tax structure and we recommend that you follow that advice. Well, we know you have heard of compounding. This basic principal exists with alpaca ownership. They multiply! Imagine getting a return of $10,000 – $15,000 +/- on your $30,000 investment in one year? This does and can happen to you. The only glitch … you do have to sell the alpacas. Too many farms are reluctant to sell the animals and their return on investment is minimized. Don’t make that mistake.Play with the following compounding table and exercise all the possibilities that would be right for you! Pricing is always determined by this factor. Alpaca ownership has enjoyed a growing interest coupled with a limited supply. Importation of alpacas started in 1984 and ceased in 1998. The U.S. alpaca registry is closed to further importation to protect our national herd. 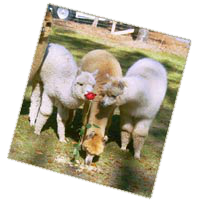 In the early years, the U.S. Alpaca Industry created a breed registry called The Alpaca Registry, Inc. (ARI). ARI houses the database of all alpacas in North America by the blood typing. When purchasing alpacas, a buyer is assured of being provided the correct genealogy of that animal. Progeny can also be tracked as well through ARI.The price of alpacas has risen throughout the years. Conformation and fiber characteristics are the fundamental guidelines of value. Exceptional females have sold for as high as $160,000 and males at 1.2 million. However, a nice female with quality fiber and good confirmation generally brings anywhere from $10,000-25,000. If that animal has won in the show ring, then the price increases. Herdsires that have proven themselves in the show ring and by their progeny also command a higher price. The alpaca is an amazingly peaceful animal. Not only is their temperament tranquil and easy for their owners, but their physiology is also sensitive and gentle to the environment. This harmonic relationship allows alpaca owners freedom from anxieties that owners of more demanding livestock must face. Padded feet- Their soft feet cannot damage any terrain, which enables an owner to have less acreage and less need for rotation. In addition, alpacas gently break the grass midway on the blade as opposed to tearing away the root system. Three-compartment stomach- Alpacas eat less than other livestock because of their ability to efficiently convert food to energy. Camelid family- While it is extremely important to provide a constant source of fresh water, the alpaca can thrive without large amounts of water. Stocking Density- Alpacas are considerably easier on the land than most other livestock. Ten alpacas can safely be managed on one acre of land. Dung- American Indians used it for fuel and gardeners recognize it as an exceptional fertilizer. Alpacas make it easy to collect. Alpacas create a communal spot to be used by all. This practice also naturally inhibits parasite infestation.